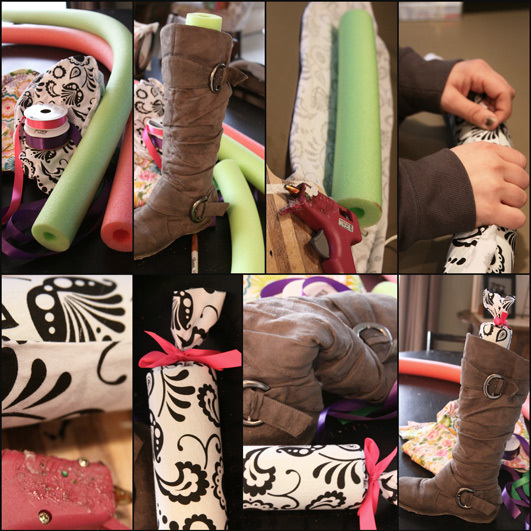 Here is a super easy no sew project for any of you ladies who love to wearing tall boots as a part of your wardrobe. Pool noodles serve as the perfect little insert to support boots during storage to keep them from folding over, and creasing. 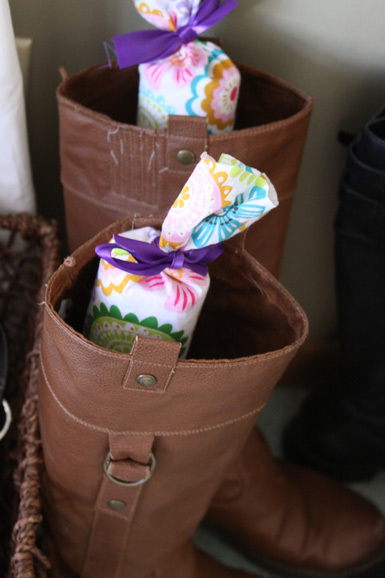 With the addition of some pretty fabric and brightly colored ribbon the pool noodles transform from an outdoor water toy to a pretty way to store boots in your closet. 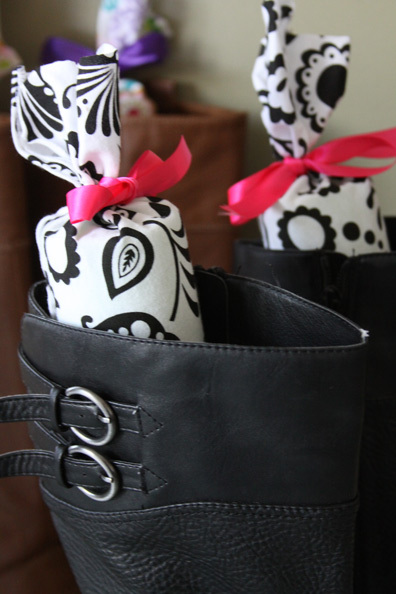 This is an inexpensive and attractive way to keep those boots upright and in great shape. 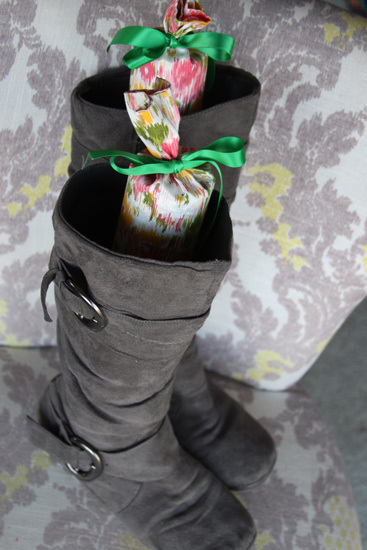 This is not only a great project to make and use in your own closet, but would make a great gift idea for any lady that you love who has a pair of boots in her own closet. 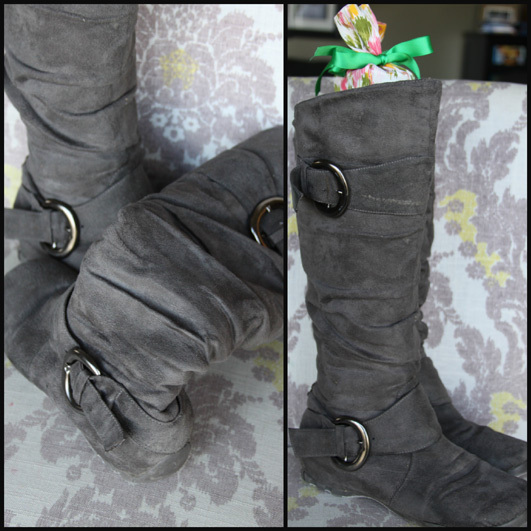 Do you have boots in your closet that fold over and crease when you store them in your closet? Here is a simple solution that is practical pretty, and so easy to put together! 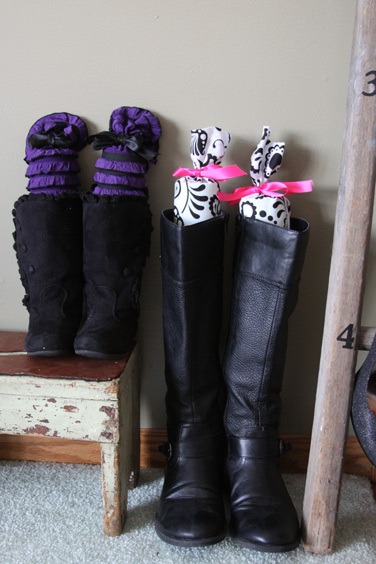 Keep those boots upright with these pretty covered pool noodle boot supports. Around Christmas time last year we were out shopping for gifts when I spotted some pretty boot inserts in the shoe section at TJ Maxx. The were all pretty and perfect covered in fabric and ribbons. 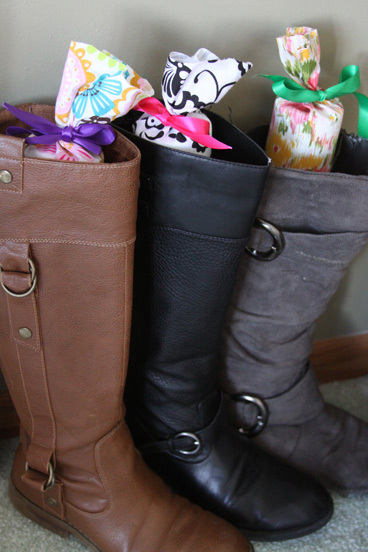 I instantly thought, that I could really use some of those for my favorite riding style boots, and that they would also make a fantastic gift idea for my favorite girl friends, sister-in laws, and even my mom. Upon investigating the pretty boot supports in the store, I found a $13.00 price tag on each pair, which was reasonable enough, but I knew I could make my own way cheaper than that! Not only would I be able to make my own for far less money, but I would be able to personalize them in the perfect colors and patterns for the woman in my life. So I used some inspiration from a Pinterest Pin (which I cannot find the original source of). The idea to cut a pool noodle and insert it into your boots as a support while storing them was pure genius. Super effective, super savvy, and so smart. So I gathered some scrap fabrics, ribbon, and my glue gone and got to work making plain old pool noddles into pretty boot supports. The end result was so similar to the boot supports that I spotted in stores, and it took me only a few minutes to make each pair. I was able to use things that I had laying around which kept my cost really low. Now, first thing is first – I went searching for the larger size pool noodles at the worst possible time where I live. The dead of winter is not the best time to buy pool noodles in Wisconsin! I really wish I had hit up the after summer sales for this project, but sadly that ship had already sailed when I got inspired to make these. I know they can be purchased at the dollar store all summer long. I had no luck at all finding new pool noodles to buy, so I literally raided the kid’s pool toy collection and “borrowed” a few pool noodles that I had grabbed earlier in the summer (which I fully intend to replace upon the arrival of summer stuff in stores). The ones that I used were the smaller diameter pool noodles which would work perfectly for those people who wear boots with narrower calf, or smaller size. They also worked great for the boots that were a little stiffer through the calf. I do, however, suggest that you use the larger sized pool noodles for boots that are very flimsy on top. They provide a little more support and would hold them up much nicer. Place a pool noodle in the boot and draw a line at the top of the boot. Cut with your serrated knife along the line you drew nice and straight. Make two the same size. Now cut some fabric with a pretty pattern the right size rectangle so it will completely cover the pool noodles that you have cut (make 2). Make sure you have at least 2 inches of extra length on the top and bottom of the noodle to allow for the fabric to be tied with a bow on each end. Lay your cut fabric out flat on your work surface and place the pool noddle in the center of it. Put a line of hot glue all the way across the length of the cut noodle and then wrap the fabric up and around laying the edge over the glue to hold it in place. Next tightly wrap and glue the fabric in place around the noddle and attach the two seams of the fabric together. I folded the edge over and glued it into place directly on top of the other edge of fabric that I had already glued in place. This made the seam a little prettier and will keep the fabric from fraying or snagging. Thats it! Now make a few more sets for gifts and insert your pretty new boots supports into your favorite pair of boots! The supports look as pretty can be stuck in the boots in the closet, and they are the perfect way to keep your investment of a great pair of boots in the best shape possible. I even created a set for my little lady with the remnants from the noodles I used for my own boots. She was helping with the project, and of course, wanted a pair of boots supports of her own for her favorite pair of boots. I used some cute ruffled fabric that I had left over from a purse making project and some black ribbon. Completely unnecessary, but they look just adorable in her little black boots. I enjoyed choosing different fabrics and color combinations to use in my 3 favorite pairs of tall boots, and tried to coordinate them in a way that I could remember which set of boot supports went with which pair of boots. 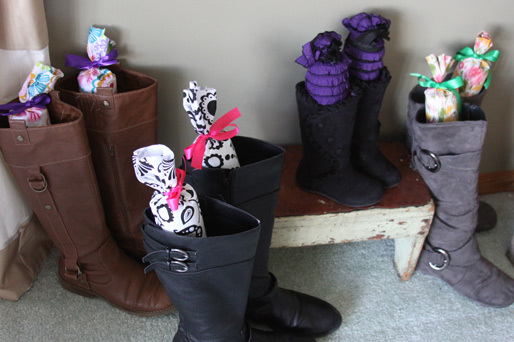 A pretty, fun way to store boots, and a great budget friendly gift idea!